This 6-bell door strap is ornamented with silver- or gold-tone steel jingle bells and a steel hanging ring the same color as the bells. The bells, ranging from 1" to 1 1/2" in diameter, are arranged so the largest bell is at the top of the strap and the smallest is at the bottom. The hanging ring is 2 1/2" across the inside, sized to slip over most residential door knobs. The entire piece is 3" wide and 19 1/2" tall, including the ring. 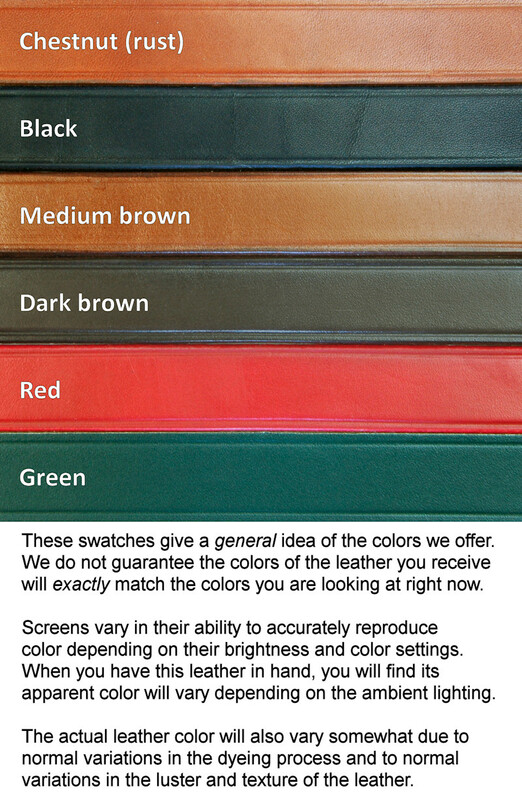 The strap itself comes in a variety of leather colors. View colors... It is cut from firm, high quality leather and is 1 1/2" wide and 17" long. (Similar straps sold by others are typically only 1" wide.) The edges of each strap are hand dyed and decoratively creased.